The town of Charlotte boast some outstanding birding sites that are well-known throughout Vermont. Examples include Mount Philo State Park, Charlotte Town Beach, McNeil Cove, and Converse Bay. All are highly regarded spots among birders. But location that is the subject of this essay–the Charlotte Park and Wildlife Refuge, is less well-known even among birders in Chittenden County, despite the fact that the site offers excellent birding opportunities and at times turn up rarities. Charlotte Park consists of 290 acres of early successional woodlands, meadows, and pastures that provide outstanding habitat for birds and other wildlife. A well-maintained hiking trail marked by many interpretive stations threads its way through the park, offering great views of Lake Champlain and the surrounding countryside. However, the use of this park by hikers and joggers is remarkably low in comparison to Colchester Pond, not that I am complaining, mind you. Likewise, my search of the VT Bird list archives revealed only12 postings referring to the Charlotte Park (including reports by some outstanding birders, I might add). This observation suggests to me that this site is relatively undiscovered by the birding community. Last May I went to Charlotte Park in search of warblers. I was not disappointed. On my first visit I spotted a Canada Warbler – a lifer for me. Later in the season I got the best look at an Eastern Towhee I have had to date. A sampling of other notables seen by me, or reported by others, includes Black-and-white, Magnolia, Blue-winged, Tennessee, Nashville, Chestnut-sided and Yellow-rumped Warbler, Common Yellowthroat, Blue-headed and Red-eyed Vireo, Gray Catbird, Brown Thrasher, Northern Cardinal, Cedar Waxwing, Wood Thrush, American Kestrel, Red-tailed Hawk, and Northern Harrier. This is an impressive list by any standard. To reach the Charlotte Park and Wildlife Refuge take Greenbush Road from Route 7 in Shelburne. Immediately after driving past Lake Road in Charlotte and passing under the railroad bridge just beyond, look for a left turn into a small, but well-marked parking lot. The Robert’s Way trail starts here. In season, an informative brochure and trail map is available to guide you on your walk. Mount Philo State Park, Vermont's first state park established in 1924, is another outstanding place for birding in Charlotte. For this reason the GMAS has held its annual Bird-a-thon in May at Mount Philo on several occasions. The one mile access road to the summit makes for an enjoyable, uncrowded walk and there are plenty of birds to be seen along the way. Warblers, thrushes, grosbeaks, vireos, and flycatchers are common. 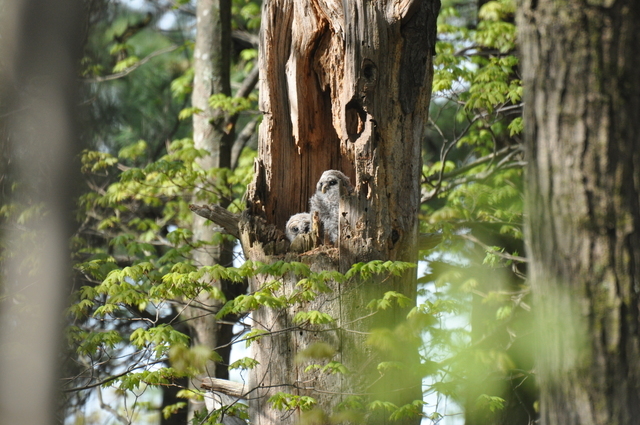 On one Bird-a-thon walk we discovered the Barred Owl nest pictured above. A bird list compiled by Ted Murin in 2011 included 101 species observed at Mount Philo during the breeding bird atlas survey. Especially noteworthy in September is the annual migration of raptors through the Champlain Valley. Hawk watchers from Vermont flock to Mount Philo to observe this annual spectacle. The record daily count according to Ted Murin was 3688 raptors, a Vermont record. Mount Philo State Park is located on Mount Philo Road in Charlotte. The Google map embedded in the introduction to birding hotspots page provides directions. Between Memorial Day and mid-October a nominal day use entrance fee applies. Enjoy.